180 workers are on the site of Stadion Śląski every day to deliver its first ever roof. The 55,000-capacity stadium is Poland’s second largest, but has been flooded with technical issues. The more relieving it is to see over 80% of the truss system already mounted onto the cable roof. White steel trusses provide framework for polyurethane panels which will cover the stadium by November. Currently 5 out of 40 segments are covered with the translucent sheets, the progress should be around 20% within days. Stadion Śląski was the most troubled Polish venue since July 2011, when first ever disaster of its kind occurred. During the so-called “big lift” operation parts of the cable roof broke and the entire design had to be changed. Series of examinations led to huge delays, which in turn led to the general contractor terminating his contract, which then resulted in court fight between the Silesian voivodship and the construction company. 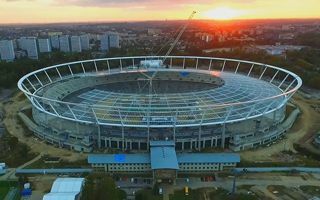 At the end of the day the only two things clear at this point are that the stadium will be delivered some 5 years behind schedule and at least a couple hundred million zloty beyond budget. Final price tag on the stadium is still unclear. Roof completion in November won’t mark end of the project altogether, because works on the ground were abandoned and need new contractors to deliver them. This is why final delivery is planned for late 2016 and opening for early 2017.